Stefano Nicolini's photographic work, 34 images in two formats (30x40 and 60x90) in black and white were created on chemical gelatin silver print on Baryta paper that enhances the professional characteristics of the volcanic Italo-Argentine architect Francisco Salamone. He was born in the province of Catania in 1897 and immigrated to Argentina at the age of four. Abstract figuratism, gigantic proportions, use of metaphors, dynamic perspective of the vertical lines, technological expressionism and technological exaltation are all emphasized by the use of reinforced concrete, the "liquid stone" that was being discovered at the time and that allowed enriching the new architectural style with innovative curves. The distorted lines in some of the 34 images on exhibit, all on film, were obtained by using a wide-angle lens, an unusual solution in architectural photography. This is Nicolini's tribute to the artist, to Salamone's new and passionate exploratio n of forms and volume, a photographic metaphor of the creative metaphor of the great Italo-Argentine architect who was only recently rediscovered in his country of adoption. Stefano Nicolini uses black and white to grasp Salamone's interpretative genius and by emphasizing the chromatic contrast in certain shots, contributes to both an intimate and ecstatic reading of his work. 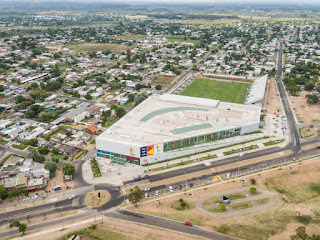 Francisco Salamone was one of the creators of the first urbanization of thirty-one settlements in the Argentina Pampas south-west of Buenos Aires, former frontier outposts, created around railroad stations and military garrisons where between 1936 and 1940, a large number of public buildings became the first signals of progress that was to arrive in the mid 1900's. Salamone's eclectic characteristic and unbridled energy allowed him to personally handle every aspect of the seventy architectural works carried out in the Pampas: from the planning to the technical direction, to drawings, to the choice of the materials of every interior furnishing (from the door knocker to the furniture, to the lights that were created in hundreds of models) to the urban elements (benches, lampposts, floors, fountains, flag-pole bases, colonnades and landscaping) to the artistic reproduction in oil and tempera of his own projects. In only 40 months, 11 city halls were built, 16 municipal delegations, 11 public parks and squares, 17 slaughterhouses, 7 portals, 4 cemeteries, 1 school and 2 markets. During that decade, even the Hispanic-American region was affected by the architectural cultural influence of the totalitarian governments in Europe represented by Stalinism, Fascism and Nazis, but also by Roosevelt's United States with the New Deal. These nations built great works aimed at expressing their power and consolidating their image historically searching for a new architectural language that expressed this revolutionary spirit. In his projects, Francisco Salamone knew how to overcome the corporate image of the absolutist state partly supported in some of his works, going well beyond a flattened alignment of authoritarianism, order and work. The "cry in the landscape" that he launched within the vastness of the planes and skies of the Pampas, that had always moulded an "unassertive" type of architecture expressed in minimal spaces by horizontal lines, was spread through the verticality that reflected the Futurist influence and that also helped him in shaping the convergence between monumentality and respecting classical lines. Some critics defined his work as a "State Art Dèco", a hybrid of classicism and modernity, where its expressive exuberance unfailingly blends the functional element with the structural one, the symbolic with the decorative aspect. Stefano Nicolini's 34 photographs represent a brilliant and attentive recognition of the accomplishments of Salamone.